An experimental new attitude towards IP licensing means that Nintendo characters will be popping up in a lot more non-Nintendo games. Desperate times call for desperate measures, and although things at Nintendo could be worse, the bigwigs are certainly looking nervous. In addition the massive pay cut the company's executives just received, Nintendo seems to be looking into new financial strategies. One of these new ideas is a radical change to the way the company handles its character IP. While Nintendo characters have traditionally been kept on a short leash, the new strategy will involve a much more flexible approach to licensing IP to fresh partners. 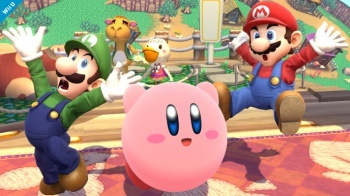 In a strategy Q&A session, Nintendo president Satoru Iwata revealed that Nintendo is already discussing new licensing arrangements with a number of potential partners. Don't expect to see Mario jumping over to the PS4 or Xbox One, though - Iwata made it clear that Nintendo intends to remain competitive, and that means keeping its icons on their home platforms. But crossovers into new genres are fair game; look out for more titles along the lines of Hyrule Warriors, the recently-announced Zelda / Dynasty Warriors Wii U mashup. None of these prospective partners have been announced as of yet, but this opens the door for a lot of great possibilities. Depending on who ends up making these games, we could be seeing classic Nintendo characters in some interesting new genres. And meanwhile, Nintendo gets some cash from the license. I'd call that a win-win.